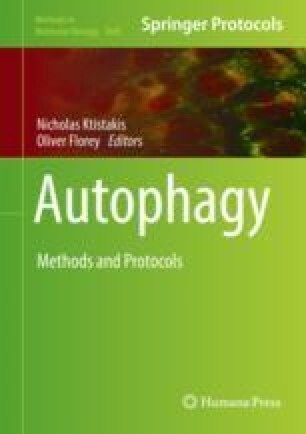 Autophagy is a central pathway utilized by many eukaryotic cells in order to recycle intracellular constituents, particularly under periods of nutrient scarcity or cellular damage. The process is evolutionarily conserved from yeast to mammals and can be highly selective with regard to the contents that are targeted for degradation. The availability of Drosophila transgenic lines and fluorophore-labeled autophagic markers allows nowadays for the more effortless visualization of the process within cells. Herein, we provide two protocols to prepare Drosophila samples for confocal and transmission electron microscopy for in vivo monitoring of mitophagy, a specific type of autophagy for the clearance of damaged or superfluous mitochondria from cells. This work was supported by BBSRC grants BB/L006324/1 and BB/P007856/1 awarded to Dr. Ioannis Nezis and the BBSRC MIBTP research training grant allocated to Panagiotis Tsapras as an MIBTP Ph.D. student.